What and awesome day for Tipsy Tuesday! I love Halloween parties so of course I was tickled to no end to be able to come up with a special spooky drink to celebrate with. I had this awesome martini glass that was my Mom’s and knew it would be perfect for a Halloween style martini. Then I set to work thinking of cool Halloween drink names. Being a huge zombieholic I of course thought I would go in that direction, but I had just been watching one of my favorite TV shows “Vampire Diaries” and it just seemed so right. 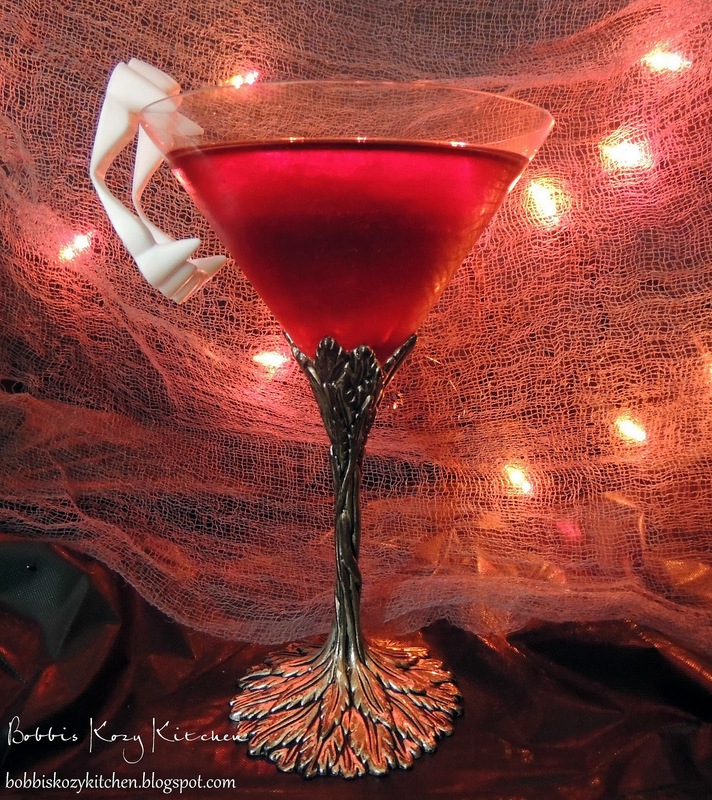 I mean Vampires Kiss sounds like a great name for a martini right? Not so much Zombie Blood. Naaa that is more of a shot drink name I am thinking. I know I have told you that, for the most part, my son is the one that comes up with the drinks for Tipsy Tuesday He is a wonderful bartender and loves the opportunity to stretch his imagination and come up with new goodies for our alcohol consumption. But this time I actually came up with the main idea. Of course he tweaked it for me when he came over. I used a bit too much Chambord and it was very sweet. That is not necessarily a bad thing. If you like a sweeter drink I would say to double the Chambord. But I like my martinis with a hint of flavor. That is what is so great about this drink. So easy to personalize it depending on who is drinking it! However you make it, this drink should be on your Halloween party planner!! Place ice, vodka, Chambord, and cranberry juice in a cocktail mixer. Shake well and strain into a martini glass.